Over/Under: Under 158.0 at 1.90 Bet Now! Second from Group A goes up against third from Group B in the opening quarter-final of the Men’s 2016 Rio Games basketball tournament. This is going to be a game that is very hard to call as both teams will feel that they have a solid chance of making it through to the semi-finals. With a 4-1 record in Group A, losing only to Brazil, Australia deserve respect in the tournament and there is a great deal to be said for backing the Australians in this match. They’ve shown great strength and a number of players have conjured up points for them at difficult times. They should have enough to deal with Lithuania but they will have a difficult match ahead of them. Like all the qualifying teams from group B, Lithuania ended with a 3-2 record but they won’t be feeling inferior coming into this game. This is a team that has a strong pedigree in recent times and they know what it takes to grind out victories. You can expect Mindaugas Kuzminskas to be in the mix when it comes to the big moments of this match. You can back Australia at -4, which is on offer at odds of 1.90. If you’re looking for the Over/Under market, you’ll be looking to go UNDER 158.0 which you can find on offer at odds of 1.90. Bet Now! In the Race to 20 Points, Australia have the edge and can be backed at odds of 1.62. The Double Result could be an interesting bet and if you take Lithuania at half-time and Australia at full-time, you’ll find odds of 6.00 on offer. There is a lot of scope for betting on the margin of victory in this game. 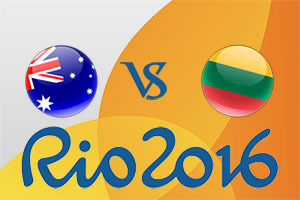 If you think Lithuania will edge it, with a margin of 3 to 6 points, you will finds off 7.00 available. If you believe that Australia will take control of the game, you can back them to win with a margin of 10 to 13 points at odds of 7.50. The game starts at 1500 BST on Wednesday 17th of August.